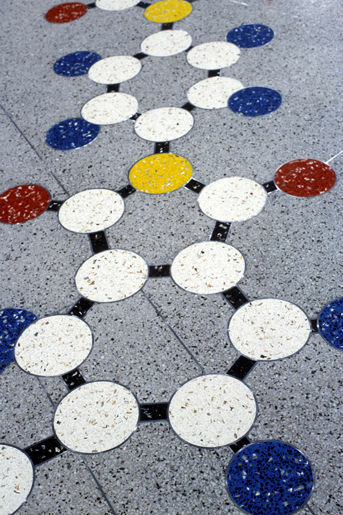 Molecular Necklace is a 29' diameter floor representing a molecular model of a new polymer synthesized at the University of Akron. It is a chemically accurate computer image manipulated into the form of a star. 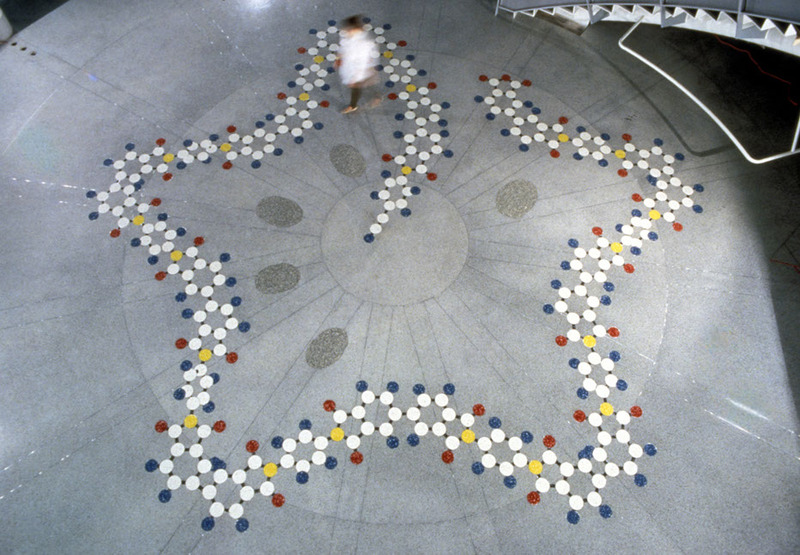 Its meaning is further enhanced by being made up of polymer materials inlaid into a traditional cement and marble terrazzo composition. 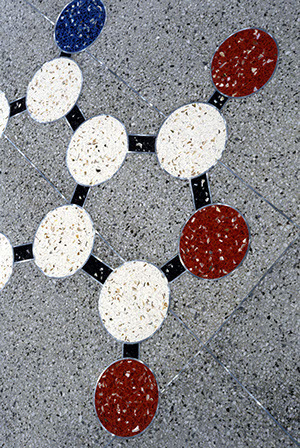 This image speaks about several things simultaneously - a polymer chain representing the cutting edge of polymer science (1994 "cornerstone" for the building), a reference to the legendary "Star Mound" in the Cuyahoga Valley, a necklace celebrating the new Akron Convention Center and the future boost to Akron's economy from polymer science research, and the crossing of ancient and modern images in the association of fresh water pearls used for trade and found in the ancient mounds, with computer visualized molecules. Polymer chemistry plays a role in exploration. Communications and electronics are all parts of our reach to the unknown. I found a reference point for the future in the distant past where artifacts discovered by archaeologists tell us something about the ancient peoples of our area, the Mount Builders of the Cuyahoga Valley. Having grown up in Northern Ohio, I am still fascinated with these mysterious peoples. Dwellers in these ancient civilizations manipulated nature, and some of the earthwork mounds still exist. Legend has it that there was a "Star Mound" at the south end of what is now the Cuyahoga Valley National Recreation Area. Actual excavations of other sites reveal two materials found in abundance in the mounds - thousands of fresh water pearls, used as necklaces and trade objects, and mica that was mined in North Carolina and traded north. I have used a touch of five fingerprints as the origin points of the central space and energy for the floor "Molecular Necklace." A star also marks a capital, and Akron, Ohio was the former rubber capital of the world. During Akron's heyday of manufacturing, the observatory built on campus became inactive due to impaired visibility. Today, polymer research holds a part of Akron's future. If clean industries are well-managed here, Akron's stars will be visible for future generations.